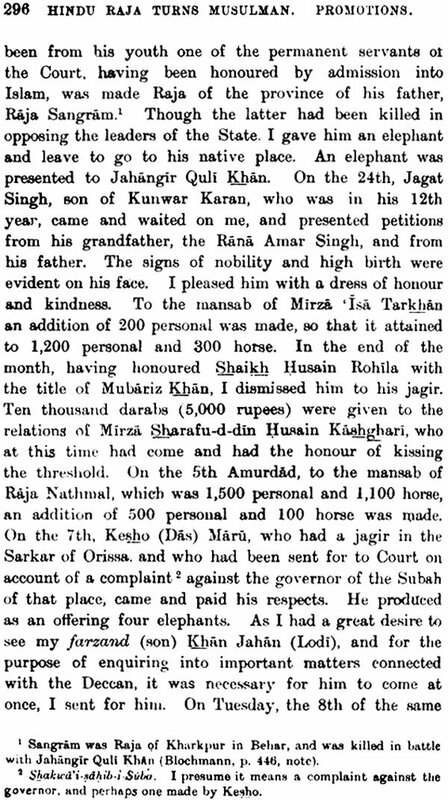 Emperor Nur-ud-din Jahangir hails from the illustrious Babur family. The memoir-writing trend descended to Babur down from his great ancestor, Amir Timur. 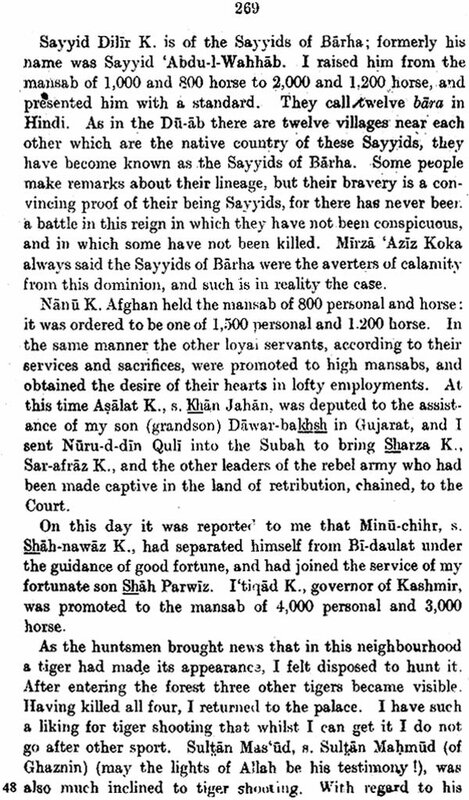 Inspite of his varied preoccupations in battles and other political knottings, Babur had well afforded to roll out his memories which outline more vividly as compared to that of his ancestors. Jahangir kept up to the scene as the 'Ruling Soul' for a long duration of twenty-two years. 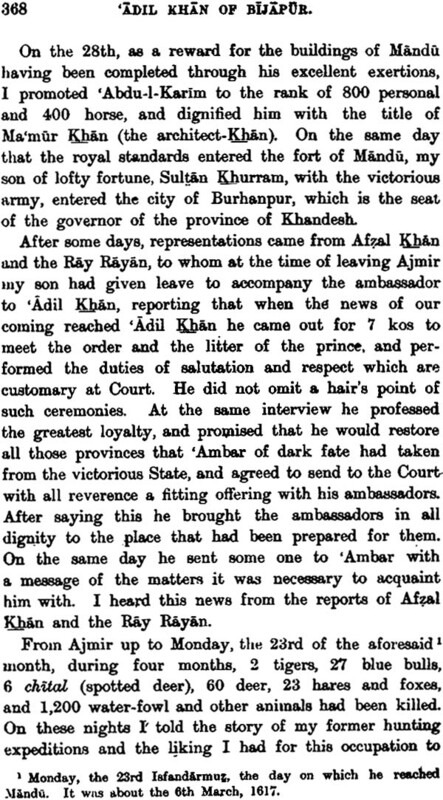 The incentive of carrying on his memories ended in the seventeenth year of his rule for break down in his health after which they were continued by Mu'tamad Khan till the nineteenth year of Jahangir's power, under his pseudo name. 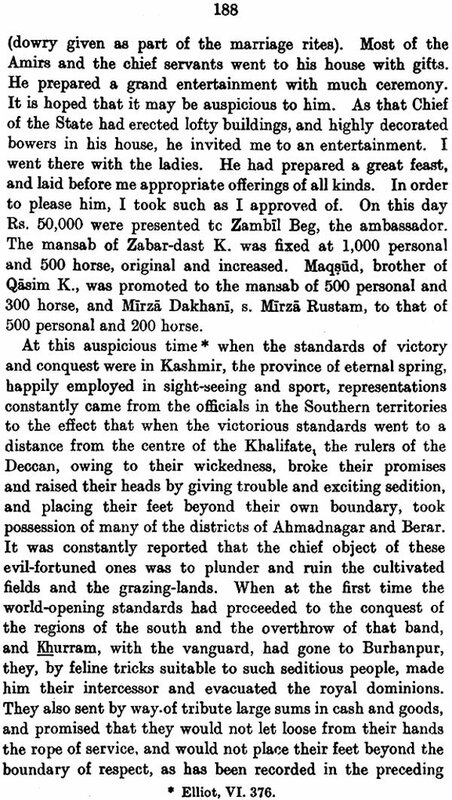 The memories were conclusively written out in the narrative of Iqbal-Nama of which Mu'tamad Khan was the distinguished author. The present Tuzuk-I-Jahangiri or Memories of Jahangir give a lively picture of India in the early decades of the seventeenth century, and are a valuable supplement to the Akbarnama and other such writings of the time. 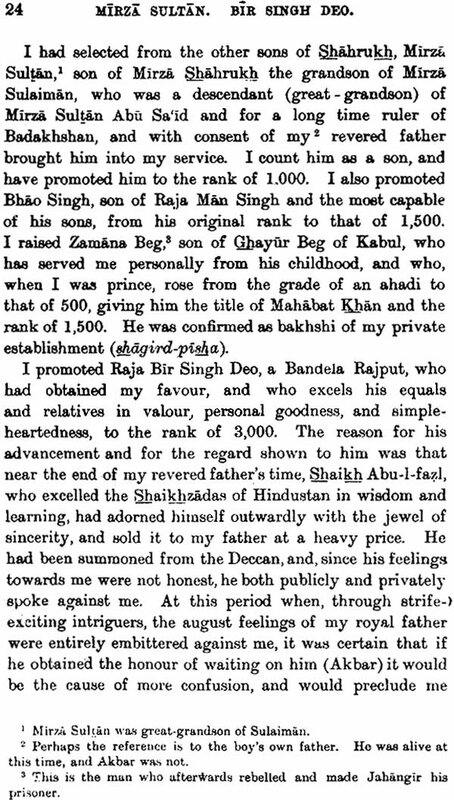 MR. ROGERS translated the Memoirs of Jahangir several years ago from the edition which Sayyid Ahmad printed at Ghazipur in 1863 and at Allyghur in 1864. 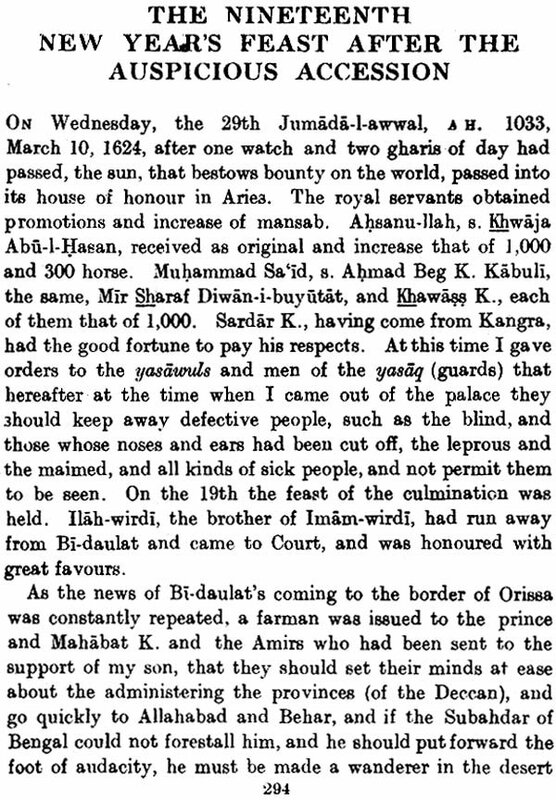 Orientalists are greatly indebted to the Sayyid for his disinterested labours, but his text seems to have been made from a single and defective MS, and is often incorrect, especially in the case of proper names. I have collated it with the excellent MSS. in the India Office and the British Museum, and have thus been able to make numerous corrections. I have also consulted the MS. in the Library of the R.A.S., but it is not a good one. I have, with Mr. Rogers’s permission, revised the translation, and I have added many notes. 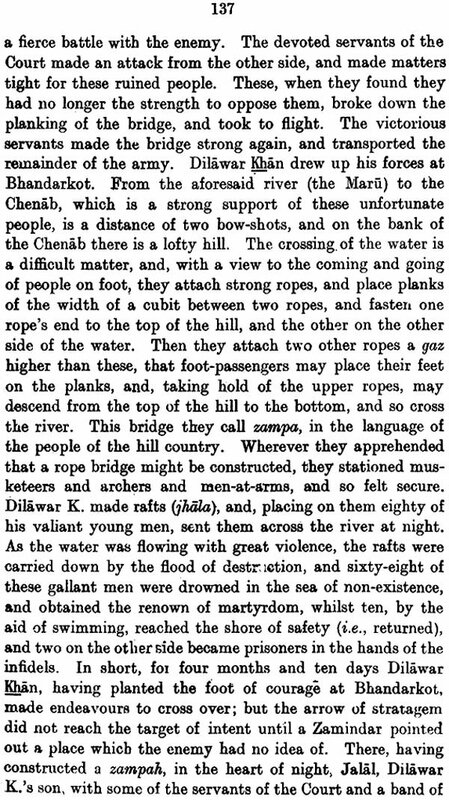 There is an account of the Memoirs in the sixth volume of Elliot & Dowson’s “History of India,” and there the subject of the various recensions is discussed. There is also a valuable note by Dr. Rieu in his” Catalogue of Persian MSS.," i, 253. It is there pointed out that there is a manuscript translation of the first nine Years of the Memoirs by William Erskine in the British Museum. I have consulted this translation and found it helpful. The MS. is numbered Add. 26,611. 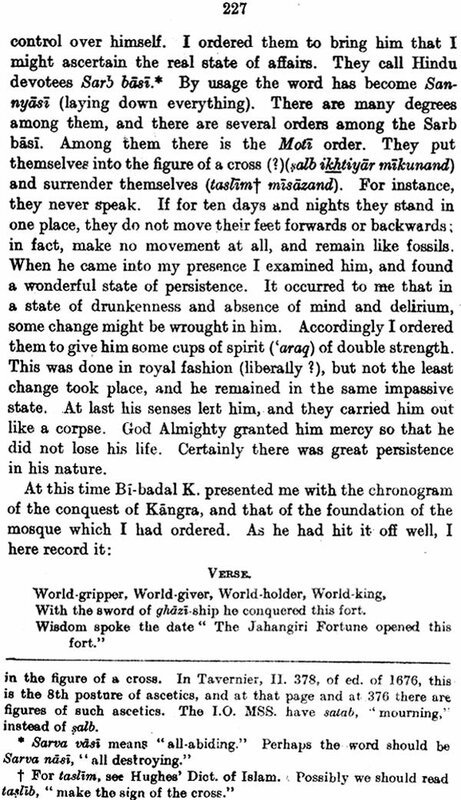 The translation is, of course, excellent, and it was made from a good MS.
A translation of what Dr. Rieu calls the garbled Memoirs of Jahangir was made by Major David Price and published by the Oriental Translation Committee of the Royal Asiatic Society in 1829. The author of this work is unknown, and its history is an unsolved problem. 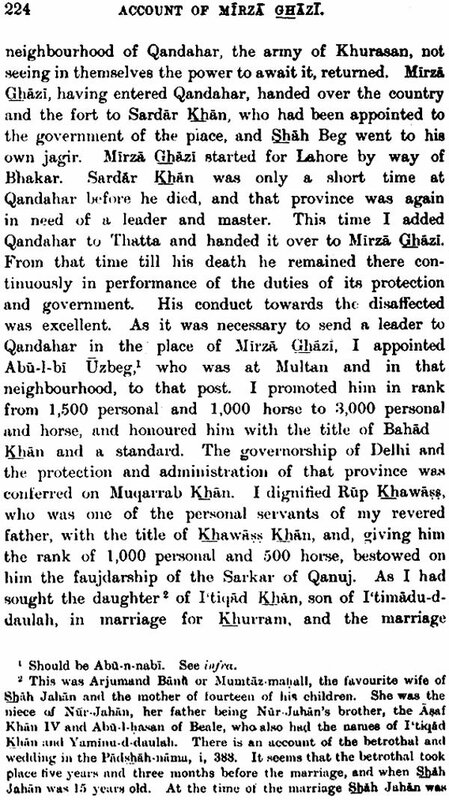 It is occasionally fuller than the genuine Memoirs, and it contains some picturesque touches, such as the account of Akbar’s deathbed. But it is certain that it is, in part at least, a fabrication, and that it contains statements which Jahangir could never have made. 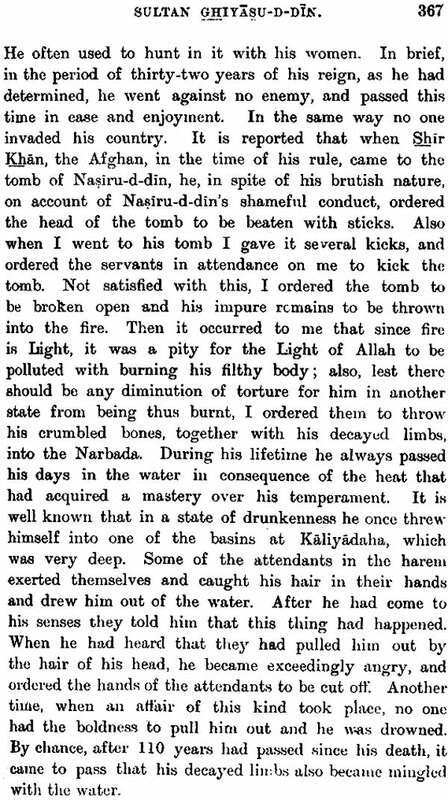 Compare, for instance, the account of the death of Sohrab, the son of Mirza Rustam, near the end of Price’s translation, pp. 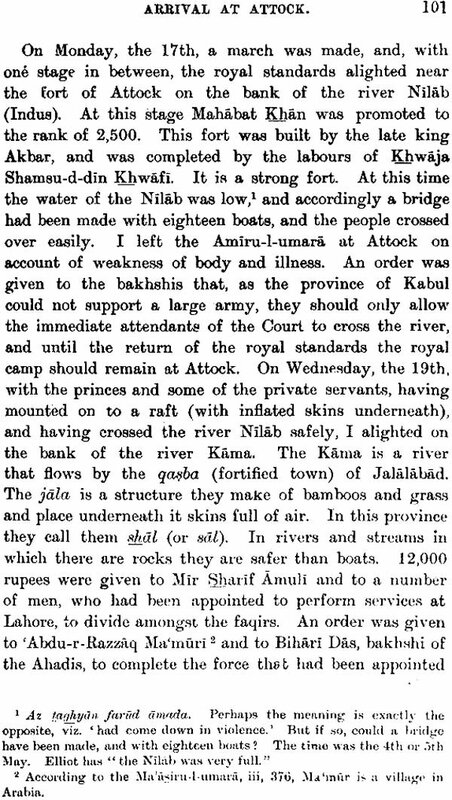 138-9, with that given in the genuine Memoirs in the narrative of the fifteenth year of the reign, p. 293, and also in the Iqbal-nama, p. 139. Besides being inaccurate, the garbled or spurious Memoirs are much shorter than the genuine work, and do not go beyond the fifteenth year. Price’s translation, too, was made from a single and badly written MS. which is now .in the R.A.S. Library. Dr. Rieu remarks that it is to be regretted that so poor a fabrication as the garbled Memoirs should have been given to the world as a genuine production of Jahangir. This being so, it is appropriate that the present translation of the genuine Memoirs should be published by the Royal Asiatic Society. 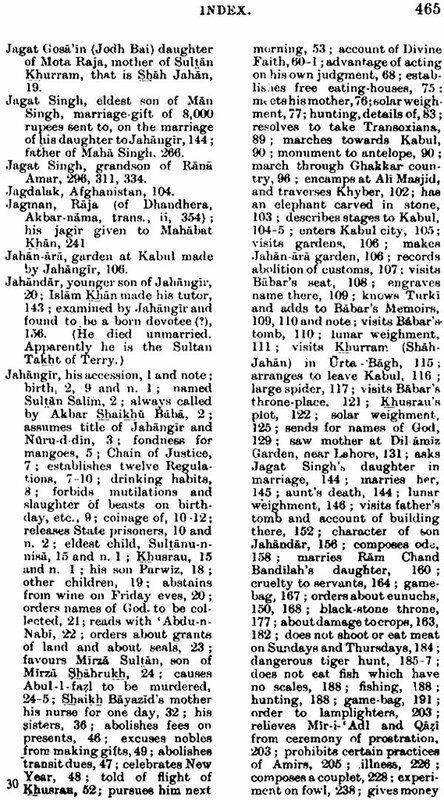 When Jahangir had written .his Memoirs for the first twelve years of his reign he made them into a volume, and had a number of copies made and distributed (Elliot, vi, 360). The first of these he gave to Shah Jahan, who was then in high favour. The present publication is a translation of the first volume of the Memoirs, but the translation of the whole Memoirs, together with the additions of Mu‘tamad Khan and Muhammad Hadi, has been completed, and it is to be hoped that its publication will follow in due course. Jahangir reigned for twenty-two years, but ill-health and sorrow made him give up the writing of his Memoirs in the seventeenth year of his reign (see Elliot, vi, 280). He then entrusted the task to Mu’tamad Khan, the author of the Iqbal-nama, who continued the Memoirs to the beginning of the nineteenth year. 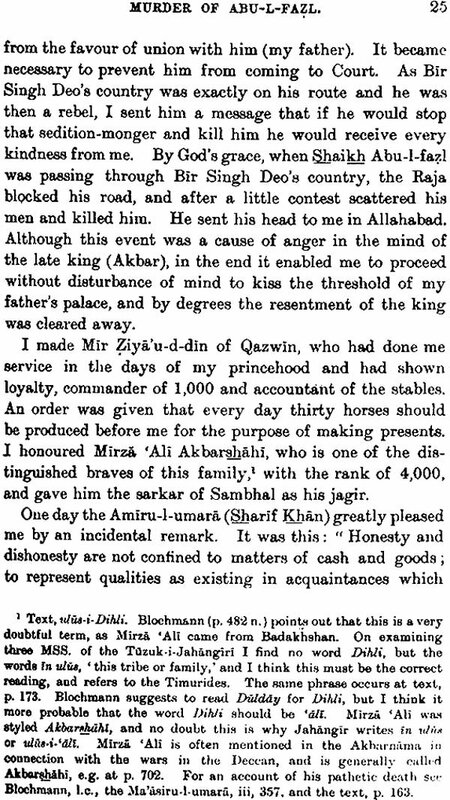 He then dropped writing the Memoirs in the name of the emperor, but he continued the narrative of the reign, to Jahangir’s death, in his own work, the Iqbal-nama, Muhammad Hadi afterwards continued the Memoirs down to Jahangir’s death, but his work is little more than an abridgment of the Iqbal-nama, Sayyid Ahmad’s edition contains the continuations of the Memoirs by Mu’tamad and Muhammad Hadi, and also Muhammad Hadi’s preface and introduction. But this preface and introduction have not been translated by Mr. Rogers, and I do not think that a translation is necessary. 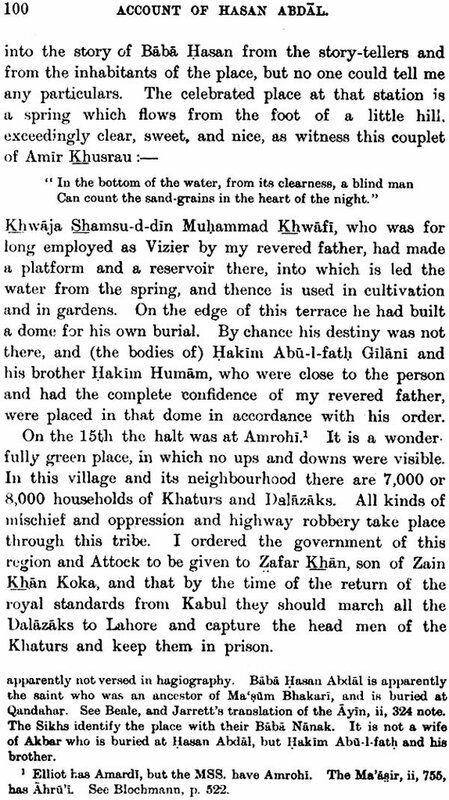 Muhammad Had is a late writer (see Elliot, vi, 392), his date being the first quarter of the eighteenth century, and his introduction seems to be almost wholly derived from the Ma’asir-i-Jahangiri of Kamgar Husaini (Elliot, vi, 257). It consists mainly of an account of Jahangir’s life from his birth up to his accession. “The Royal authors of the East had more blood in them than those kings whose works have been catalogued by Horace Walpole. To find a parallel to them we must go back to Julius Caesar, and even then the advantage is not upon the side of Europe. After all, the commentaries of the famous Roman are a little disappointing, and certainly the Memoirs of Babar and Jahangir are far more human and fuller of matter than the story of the Gallic Wars. 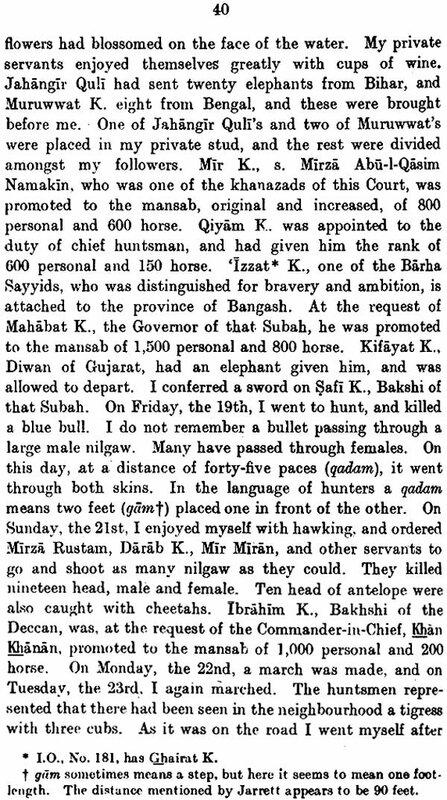 All Muhammadans have a fancy for writing chronicles and autobiographies, and several Muhammadan kings have yielded to the common impulse. Central Asia has given us the Memoirs of Tamarlane, Babar, and Haidar, and the chronicle of Abu-l-ghazi; Persia has given us the Memoirs of Shah Tahmasp, and India the Memoirs of the Princess Gulbadan and Jahangir. In modern times we see the same impulse at work, for we have the biography of the late Ameer of Afghanistan and the diary of the Shah of Persia. “The contributions to literature by Royal authors which come to us from the East form a department by them- selves, and one which is of great value. Nearly all Eastern histories are disfigured by adulation. Even when the author has had no special reason for flattery and for suppression of truth, he has been dazzled by the greatness of his subject, and gives us a picture which no more reveals the real king than does a telescope the real constitution of the Morning Star. But when Eastern monarchs give us chronicles, the case is different. They have no occasion for fear or favour, and mercilessly expose the failings of their contemporaries. Not that they are to be trusted any more than other Orientals when speaking of themselves. 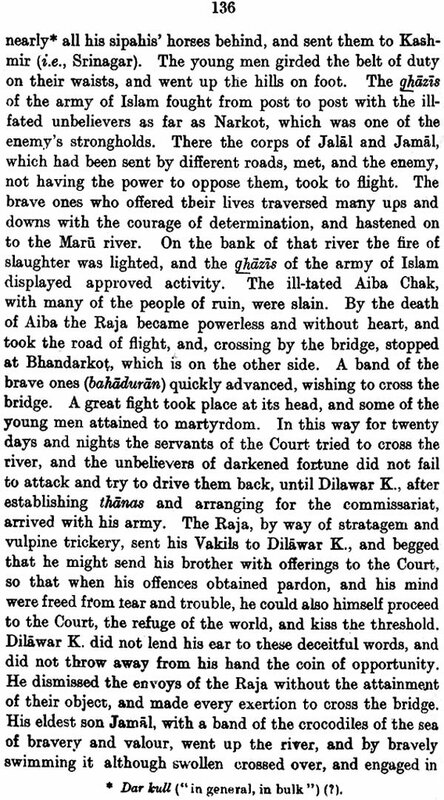 Babar has suppressed the story of his vassalage to Shah Isma’il, of his defeat at Ghajdawan, and his treatment of ‘Alam Lodi; and Jahangir has glossed over his rebellion against his father, and the circumstances of Shir-afgan’s death. But when they have to speak of others-whether kings or nobles- they give us the whole truth, and perhaps a little more. 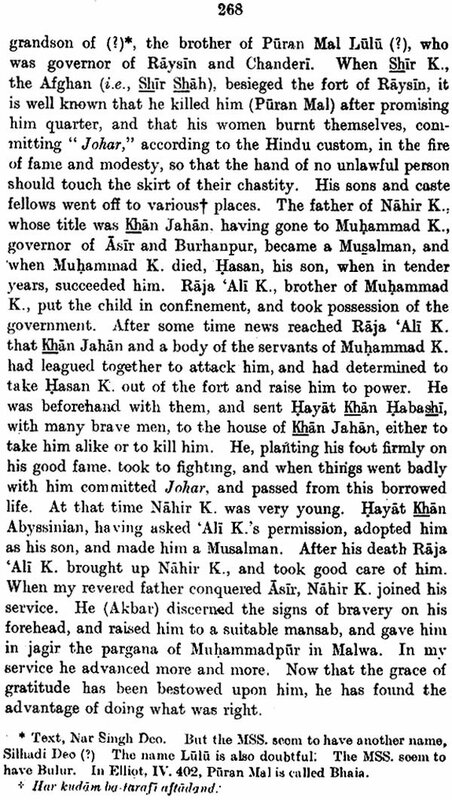 An amiable Princess like Gulbadan Begam may veil the faults and weaknesses of her brothers Humayun and Hindal ; but Babar strips the gilt off nearly everyone whom he mentions, and spares no one-not even his own father. and be soft-hearted enough to wish that his father were alive to share with him the delicious mangoes of India. He could procure the murder of Abu-l-fazl and avow the fact without remorse, and also pity the royal elephants because they shivered in winter when they sprinkled themselves with cold water. ‘I observed this,’ he says, ‘and so I ordered that the water should be heated to the temperature of luke-warm milk.’ And he adds: ‘This was entirely my own idea; nobody had ever thought of it before.’ One good trait in Jahangir was his hearty enjoyment of Nature and his love for flowers. 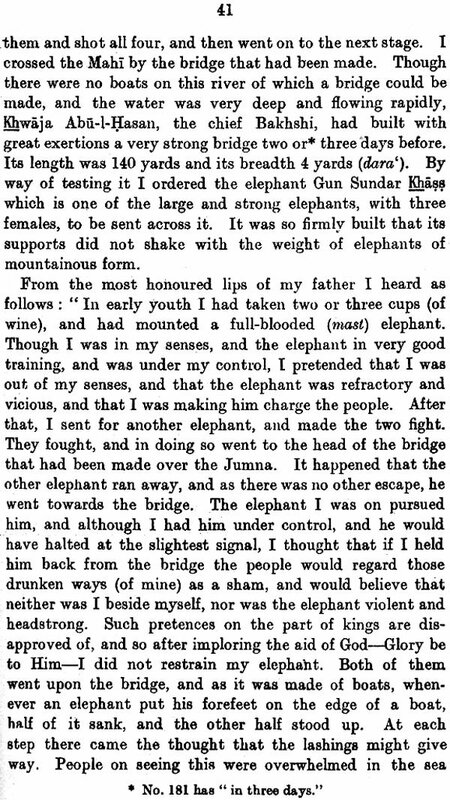 Babar had this also, but he was old, or at- least worn out, when he came to India, and he was disgusted by an Indian attempt to poison him, and so his description of India is meagre and splenetic. Jahangir, on the other hand, is a true Indian, and dwells delightedly on the charms of Indian flowers, particularizes the palas, the bokul, and the champs, and avows that no fruit of Afghanistan or Central Asia is equal to the mango. He loved, too, to converse with pandits and Hindu ascetics, though he is contemptuous of their avatars, and causes the image of Vishnu as the boar avatar to be broken and flung into the Pushkar lake. “It is a remark of Hallam’s that the best attribute of Muhammadan princes is a rigorous justice in chastising the offences of others. Of this quality Jahangir, in spite of all his weaknesses, had a large share, and even to this day he is spoken of with respect by Muhammadans on account of his love of justice. 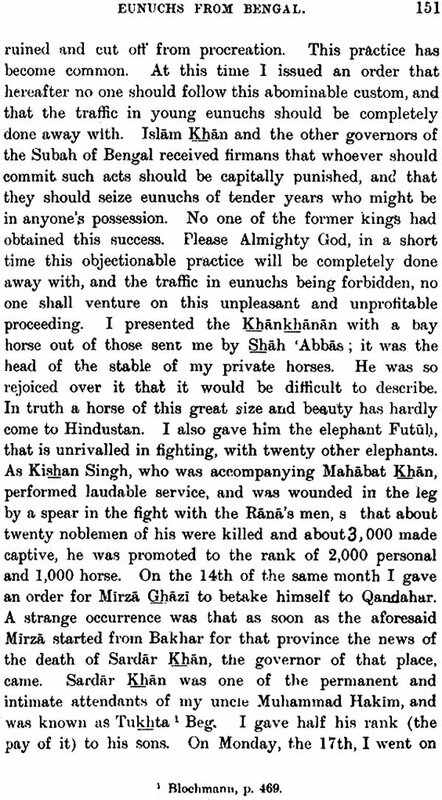 It is a pathetic circumstance that it was this princely quality which was to some extent the cause of the great affront put upon him by Mahabat, Khan. Many complaints had been made to Jahangir of the oppressions of Mahabat in Bengal, and crowds of suppliants had come to Jahangir’s camp. 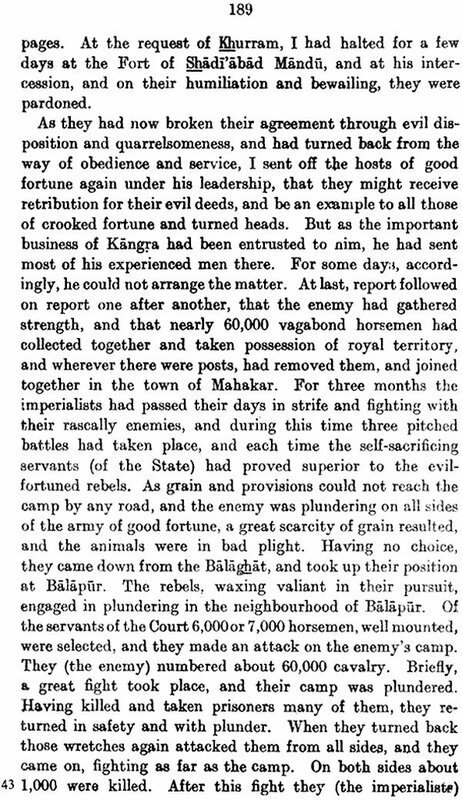 It was his desire to give them redress and to punish Mahabat, for his exactions, together with his physical and mental weakness, which led to his capture on the banks of the Jhilam. “The same quatrain has also been quoted by Badayuni in his history, and the interesting thing about Jahangir’s quotation of it is that he could see the beauty of the verse and at the same time did not know who was the author. There is also an interest in the fact that the third line contains a different reading from that given in Whinfield’s edition of the text. Hindaun is in the Jaipur territory, and one would like to know if the inscription still exists. 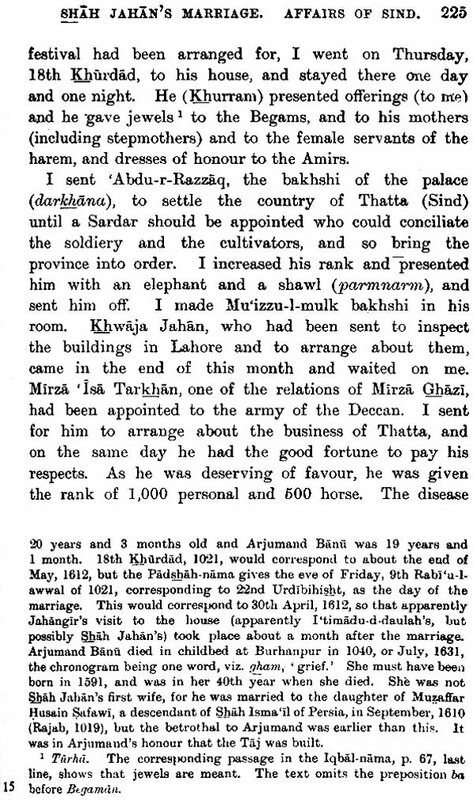 As regards the bibliography of the Tuzuk-i-Jahangir, I have to note that there is an Urdu translation by Munshi Ahmad ‘Ali Simab of Rampura, that is, Aligarh in Tonk. 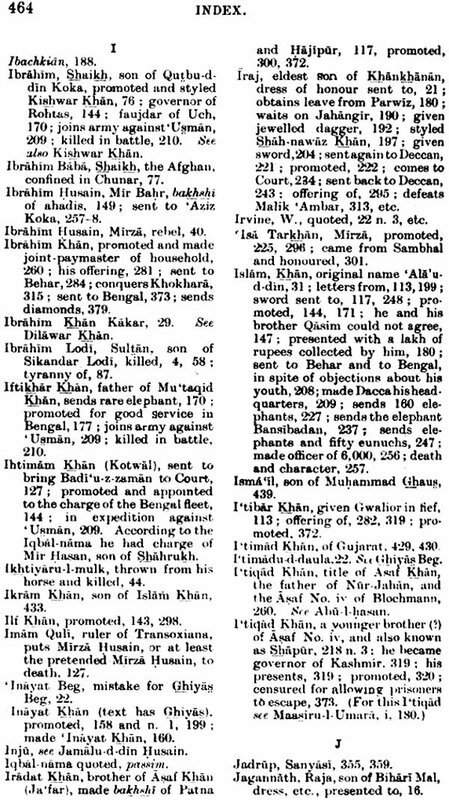 It was made from Muhammad Hadi’s edition under the patronage of Muhammad Ibrahim ‘Ali Khan Nawab of Tonk, and was published by Newal Kishor in 1291 (1874). 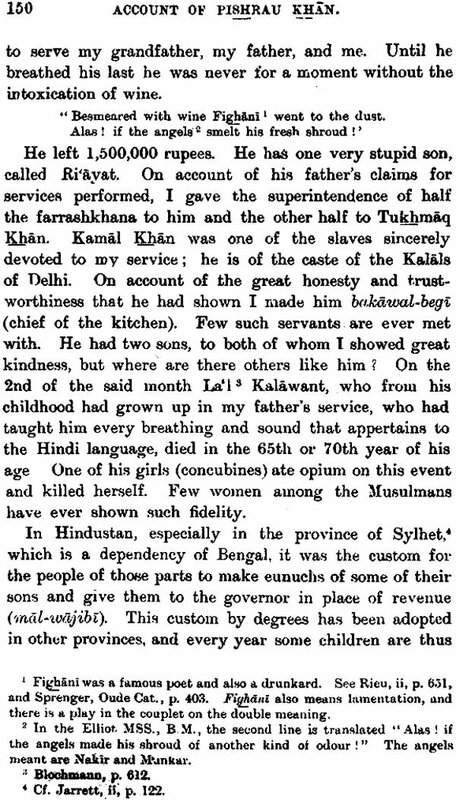 There is also a Hindi translation by Munshi Debi Prasad which was published in 1905 at Calcutta by the Bharat Mitra Press. The Urdu translation referred to by Mr. Blumhardt in his Catalogue of Hindustani MSS., p. 61, and noticed by Elliot, vi, 401, and Garcin de Tassy, iii, 301, is, as the two latter writers have remarked, & translation of the Iqbal-nama, The MS. referred to by Elliot vi, 277, as having been in the possession of General Thomas Paterson Smith, and which is described in Ethe’s Catalogue of the India Office MSS., No. 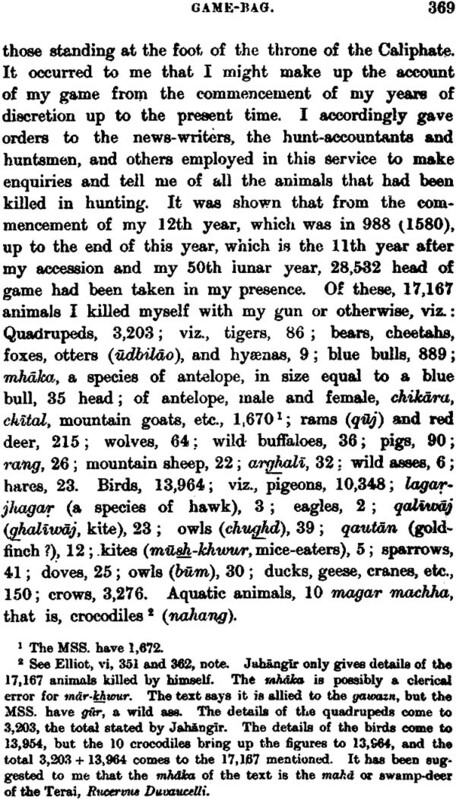 2833, p. 1533, was made by Sayyid Muhammed, the elder brother of Sayyid Ahmad. 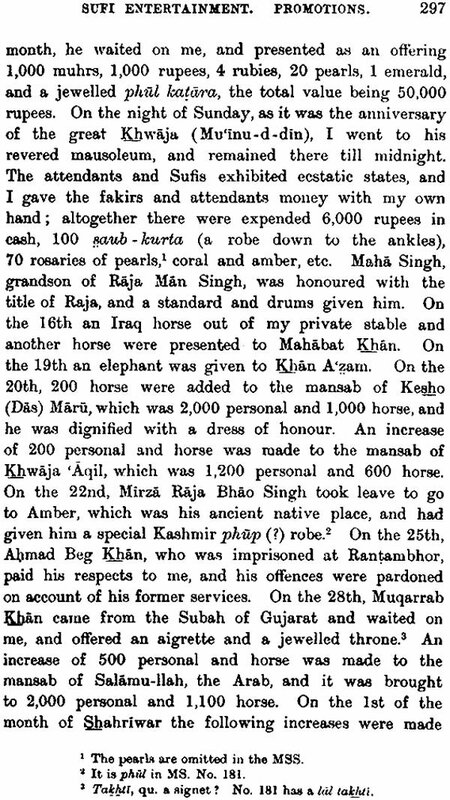 AB the end of the MS. the copyist gives some account of himself and of his family He made the copy from copies in the Royal Library and in the possession of Rajah Roghu Nath Singh alias Lal Singh Jaipur. He finished it in October. 1843. Sayyid Muhammad was Munsif of Hutgam in the Fathpur district. He died young in 1845. 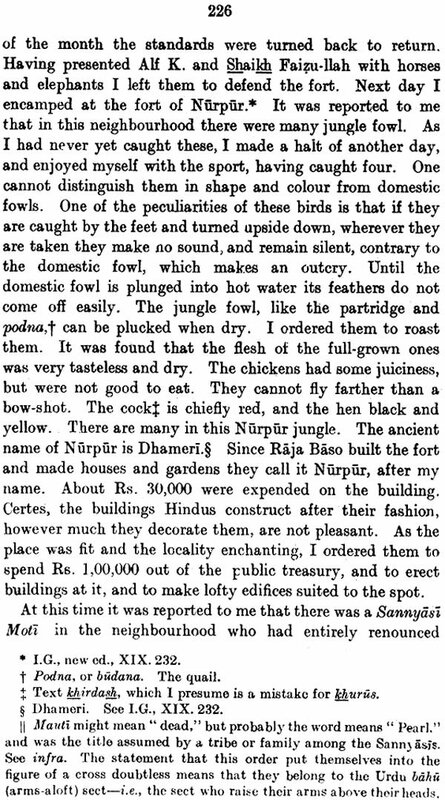 My friend Mr. T. W. Arnold, of the India Office, informs me that Sayyid Ahmad told him that he found a valuable illustrated ME of the Tuzuk in the debris of the Delhi Royal Library, and took it home, but that it was lost when his house was plundered by the mutineers. There is in the Bodleian a copy in Sayyid Ahmad’s own handwriting. He states that he made use of ten good MSS. The Englishman at whose- request he made the copy was John Panton Gubbins, who was once Sessions Judge -of Delhi. This copy is described in the Bodleian Catalogue, p. 117, No. 221. The MS. No. 220 described on the same page was brought home by Fraser, and is a good one, hut only goes down to the end of the 14th year. I started translate this book to Uzbek language many years ago. If anybody have info concerning its translations to european languages pls let me know.